When deciding upon the perfect promotional gift to place your brand on, it’s the best to have something useful. Promoting on a flash drive is a good way to increase your brands awareness, however these are more likely to be misplaced or lost. So an even better way to promote is with a useful and wallet sized custom designed branded flash drive business card. Why promote with a branded flash drive business card? The pull-out flash drive is easy to use and can easily be stored after using, for example in a wallet. Having this branded flash drive business card in the wallet, your costumers thinks of your company or your new campaign every time they open it. Another big benefit of the branded flash drive business card is the big branding space. With interesting artwork on it, it’s a good way to keep your company in mind. 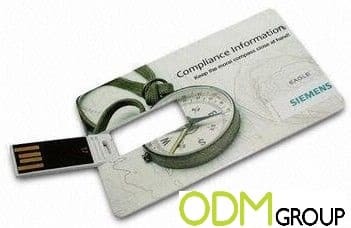 Siemens just found a good way with its branded flash drive business card to promote its “compliance information” campaign. 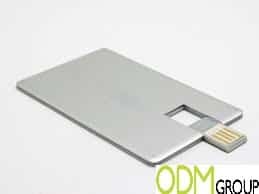 The application possibilities of the branded flash drive business card are various. It’s possible to print whatever you want on the surface, for example a campaign for your new beer type, your recently launched car, your new credit card or just your logo.